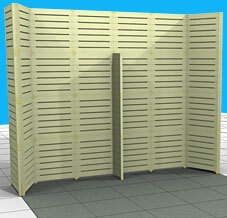 Includes 24 - 6 ft x 2 ft panels, 11 - 6 ft x 1 ft panels and the required connectors. Your choice of colors include ivory, black or white. 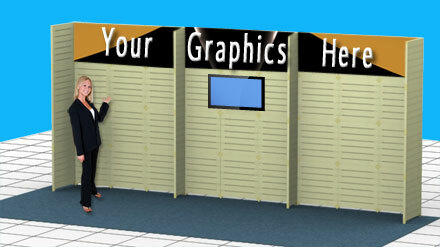 Add graphics to personalize your booth. 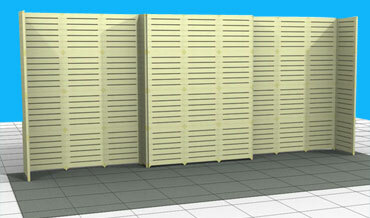 Includes 20 - 6 ft x 2 ft panels, 13 - 6 ft x 1 ft panels and the required connectors. 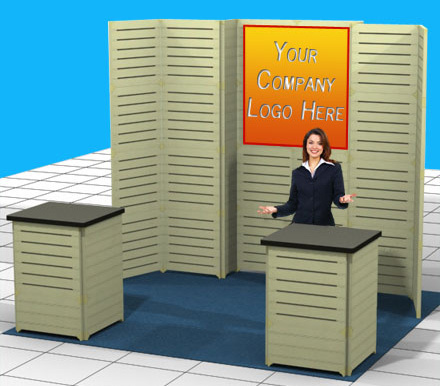 Includes 19 - 6 ft x 2 ft panels, 15 - 6 ft x 1 ft panels and the required connectors. 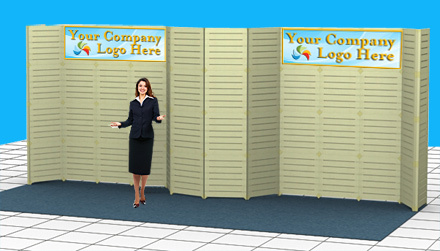 Includes 57 - 2 ft. x 2 ft. panels and 45 - 1 ft. x 2 ft. panels. 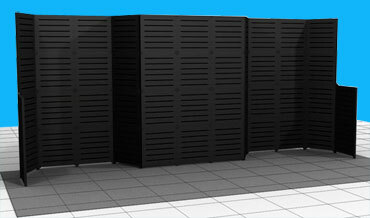 Includes 72 - 2 ft. x 2 ft. panels and 33 - 1 ft. x 2 ft. panels and the required connectors. 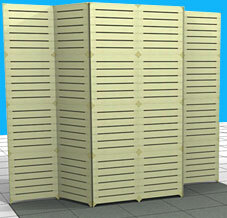 Includes 48 - 2 ft. x 2 ft. panels and 42 - 1 ft. x 2 ft. panels and the required connectors. 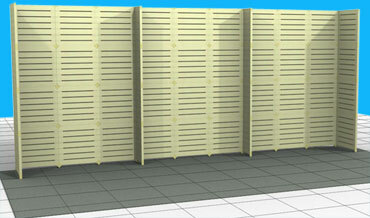 Includes 42 - 2 ft. x 2 ft. panels and 45 - 1 ft. x 2 ft. panels and the required connectors. 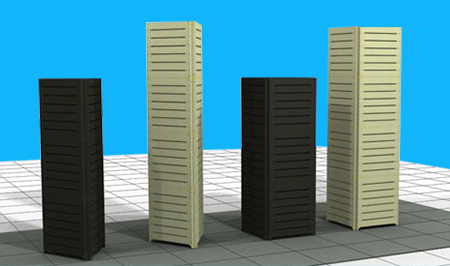 Includes 86 - 2 ft. x 2 ft. panels and the required connectors. Rental as low as $1,460. Call for details. 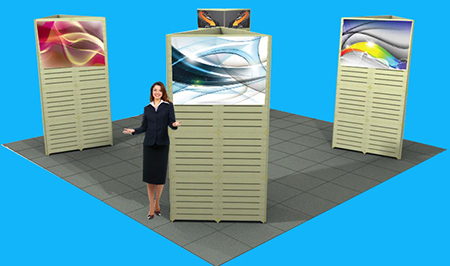 Includes 56 - 2 ft. x 2 ft. panels and the required connectors. 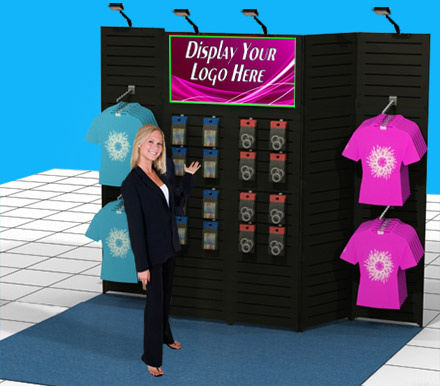 Great design to display multiple product lines. 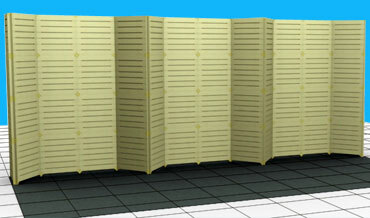 Includes 44 - 2 ft. x 2 ft. panels plus 8 1ft. x 2ft. panels and the required connectors. Rental as low as $1,160. Call for details. 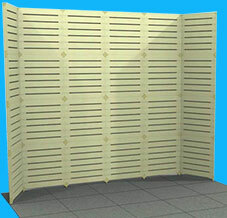 Includes 44 - 2 ft. x 2 ft. panels plus 8 - 8 1ft x 2ft panels and the required connectors to assemble three slat wall sections, each measuring 6 ft. wide by 8 ft. high. 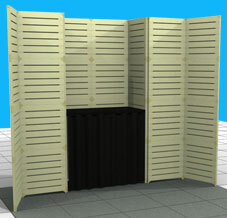 Includes 48 - 2 ft. x 2 ft. panels and the required connectors. 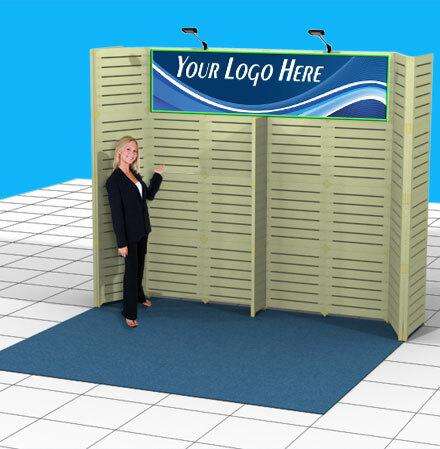 Includes 36 - 2 ft. x 2 ft. panels and the required connectors plus two - 2 ft. by 2 ft. greeting and storage counters. Rental as low as $1,660. Call for details. 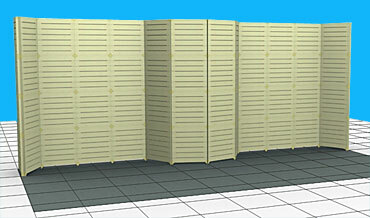 Includes 36 - 2 ft. x 2 ft. panels and the required connectors plus a 4 ft. storage counter. Rental as low as $1,360. Call for details. 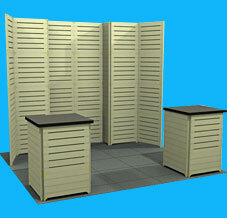 Includes 32 - 2 ft. x 2 ft. panels and the required connectors plus a built in 4 ft. counter with storage. 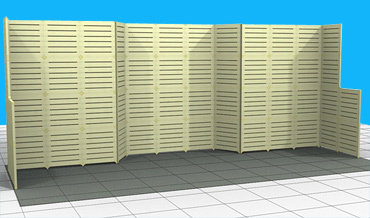 Includes 32 - 2 ft. x 2 ft. panels plus 3 1ft x 2ft panels and the required connectors. Rental as low as $860. Call for details. 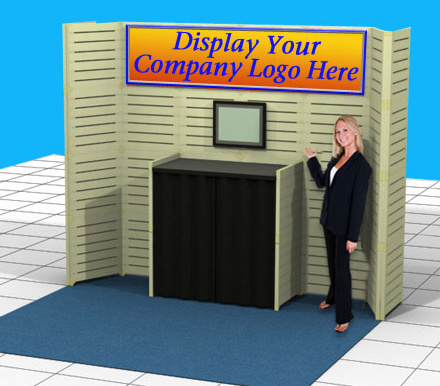 Includes 24 - 2 ft. x 2 ft. panels and the required connectors. Rental as low as $560. Call for details. 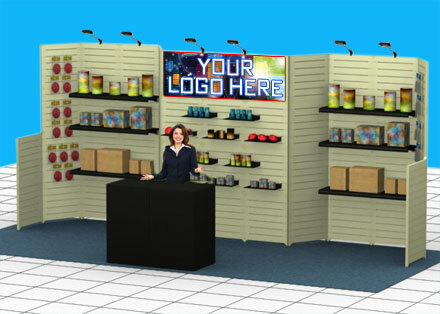 Table Top Display includes 12 - 2 ft. x 2 ft. panels and the required connectors. 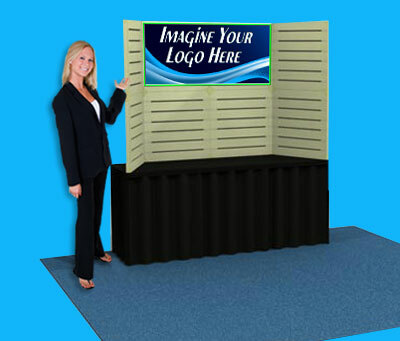 Table top displays sets up in less than 10 minutes, is extra sturdy for heavier display items. 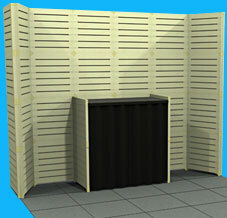 Each slat wall panel is 24”x24” and made of strong PVC plastic. 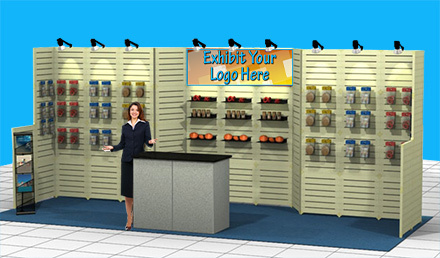 Customize with shelves & fixtures, spotlights, counters, signs, etc. Your choice of colors include ivory, black or white. Rental as low as $340. Call for details. Rental as low as $240. Call for details. 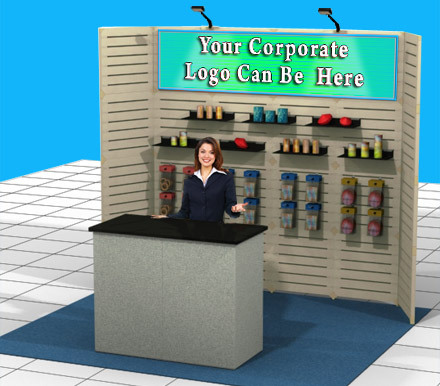 Table Top Display includes 8 - 2 ft. x 2 ft. panels and the required connectors. 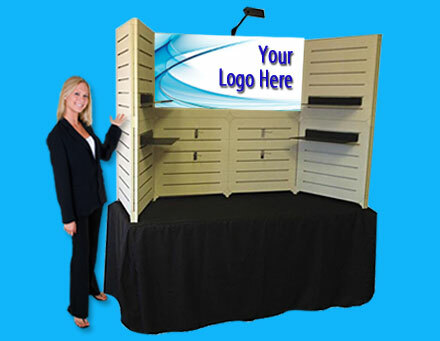 Table top displays sets up in less than 10 minutes and fits in 1 lightweight box.